The first team captain and Club legend Andrés Iniesta was given a fitting farewell in the final match day of the 2017/18 season as Valverde’s team won 1-0 with a thunderbolt strike from Coutinho. Before kick-off, a fabulous mosaic saying ‘Infinit Iniesta’ greeted Andrés as the teams came onto the pitch. The captain and Xabi Prieto, from Real Sociedad, then shared a touching moment as the two one-club players said goodbye to their respective teams on the same night. Once the game started, Ter Stegen was called into action with a comfortable save from a Willian José header within a minute. Soon after, the Iniesta received his first cheer, but definitely not his last, as he got on the ball early on. The French winger went on a winding run and Suárez and Iniesta combined well as Barça showed some attacking intent in an open start to the match. In the 17th minute, Suárez turned and he was brought down on the edge of the box for a free kick; however, his powerful effort struck the wall. Piqué then had a shot from inside the box that went wide. 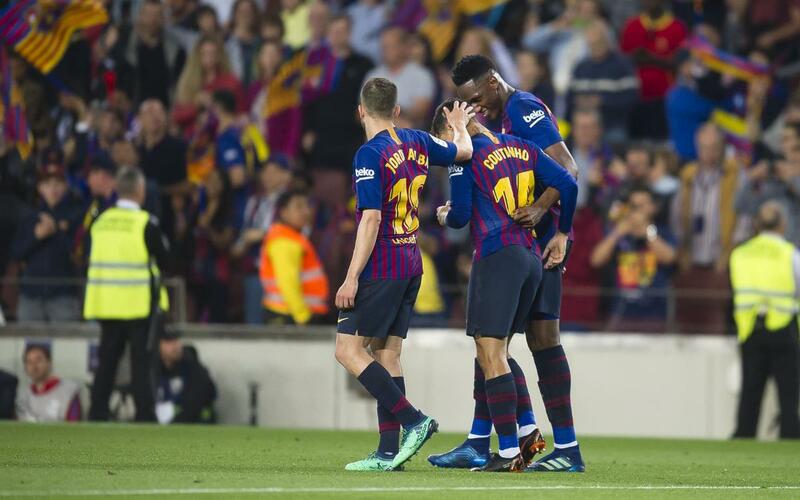 In the 25th minute, the tricky Dembélé almost fashioned the opener as he crossed excellently for Rakitic, who headed inches wide of Moyá’s post. Real Sociedad were in the game as they were defending well and committing men forwards. They went close themselves on a couple of occasions with Oyarzabal shooting wide when well placed inside the box. The Basque player then fed Willian José on the edge of the box, but the centre forward shot harmlessly over the bar. Soon after, Dembélé was cynically and dangerously brought down as he was flying down the right wing by Raúl Navas. The Real Sociedad defender was given a yellow card and Coutinho’s free kick ended up in Moyá’s hands. Iniesta was everywhere, gracefully roaming around the pitch and fizzing first time passes to his teammates in his usual fashion. However, despite a few openings, the blaugranas struggled to create any clear-cut chances in the opening 45 minutes. The second half kicked off like the first, with Real Sociedad on the attack. Barça then patiently held onto the ball but were well contained by the visitors. Denis Suárez came on for Dembélé in the 53rd minute. The Brazilian playmaker conjured a goal out of nowhere to give his side the lead in the 57th minute (1-0). He picked up the ball near the halfway line, drove forwards, checked, worked his way back inside on the edge of the box before curling an absolutely beautiful shot that went in off the post. Coutinho was then substituted for Messi ten minutes later. Iniesta continued to play excellently as his teammates looked for him at every opportunity. He was combining beautifully with Jordi Alba in particular down the right-hand channel. Messi played a one-two with Suárez and headed into the hands of Moyá as Valverde’s players looked to make it two. Illarramendi almost drew his side level with a rasping shot following a corner which went just wide. Moments later, Iniesta was substituted for Paco Alcácer. The crowd gave him a prolonged standing ovation and he received lots of hugs from Barça players in what was an emotional moment for everyone at the stadium. The substitute could have doubled the lead but his shot went over the bar. In the end, just the one goal was enough to secure the win. The fans turned out in numbers, 84,168 to be exact, and gave the legendary Iniesta a night to remember as the curtain closed on the team’s double-winning season. You’ll be missed!